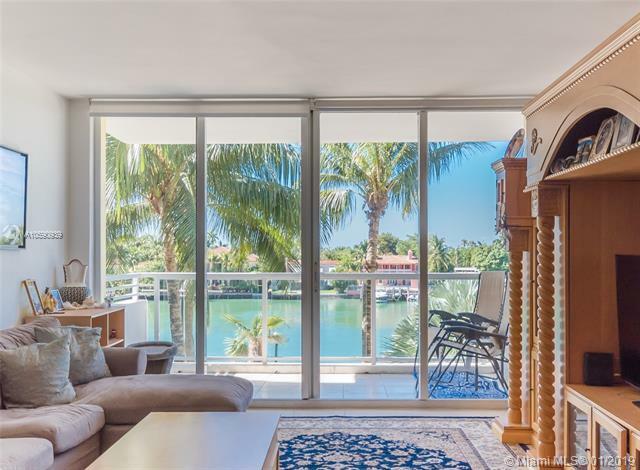 WATER VIEWS from this great apt in a chic, boutique hotel-styled condo on prestigious Millionaires Row. Stainless steel appliances and NO carpet. Storage unit on same floor. BOAT DOCK available for rent -direct access to bay & open ocean! Water views from every window, gorgeous mansions along the water, see dolphins and manatees and the rare opportunity to have your boat docked in your backyard! Full amenity building is only steps from the beach. Building has on-site restaurant, dry cleaners, huge fitness center, recently renovated resort-like pool, BBQ, childrens play area, billiards, and more. Building has 24/7 security and valet parking service. Water, Cable and A/C included in the maintenance fees. Tenant Occupied. Tenant paying $2600/m and would like to renew lease. Great tenant. Amazing apartement with great bay view. Kitchen and bathrooms remodeled, new Stainless steel appliances. Private storage on the same floor. Building has heated pool that has just been renovated, boat dock, amazing gym, new elevators, restaurant on pool deck. Across the street from Collins avenue, the ocean and directly on the canal. This apartment has everything you need. Cable tv, internet 100 giga, water and air condition electricity included in maintenance fee. Amazing oversized NW corner unit on Millionaires Row. Sweeping views from every window showcase the Intracoastal waterway, Biscayne Bay, downtown Miami and the La Gorce golf course. The large balcony is accessed from the living room and master bedroom and has an Ocean and pool view. With 1,660 sq feet, 2 large bedrooms, 2 baths, and one assigned parking space, this apartment is perfect as a full time residence or luxurious vacation home. An open kitchen with stainless steel appliances and granite counter tops, washer/dryer in the unit, and Jacuzzi tub with separate shower offer all the modern comforts. The building is a full service resort with a beautiful pool, cabanas, fitness center, club room, 24 hour security and boat dock availability.